If you are looking for a narrow car seat to fit 3 in a row, you have come to the right place. Even if you have a large SUV or minivan, it can be a challenge to fit multiple car seats in the back, so this is why it is helpful to find the narrowest car seat on the market. Below are the best narrow infant car seats. At only 17 inches wide, the Chicco Keyfit car seat is one of the best narrow car seat for infants. It fits infants from 4-30 pounds and up to 30 inches tall. It comes with a removable full body insert for smaller babies 4-11 pounds. This Chicco baby car seat is lined with energy-absorbing foam for increased safety and comfort. It features a 5-point harness that adjusts with one-pull tightener for easy adjustments and secure fit. There are indicators on either side of the Chicco infant car seat base to determine accurate seat angle. One of the best things about the Keyfit car seat is that it is one of the easiest car seats to install. You can use either the LATCH system or the vehicle’s safety belts. For cars without LATCH, the Keyfit infant car seat can be installed using a built-in, belt-routing lockoff system. The Keyfit has an adjustable, multi-position canopy. The Keyfit is also FAA approved for use in an airplane. 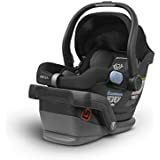 These car seats are compatible with dozens of Chicco’s strollers, including Chicco Bravo, Cortina, Cortina Together, Neuvo, Activ3, TRE, Liteway Plus, and KeyFit Caddy strollers. For further information, read our Chicco Keyfit 30 review. 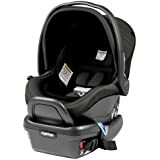 For less than $200, the Chicco Keyfit is amongst the best narrow infant car seat on the market. The UPPAbaby MESA car seat, a premium infant car seat, measures about 17 inches wide at its widest point. The MESA infant car seat base only measures 14 inches wide, making it one of the best narrow infant car seat base. The MESA is one of the top lightweight infant car seat, weighing only less than 10 pounds. It fits babies 4-35 lbs and up to 32 inches tall. it includes an infant insert with a built-in wedge that creates a flatter and safer riding position, perfect for babies 4-8 lbs. The MESA car seat provides your child the necessary side impact protection with its EPP foam reinforced headrest. The MESA is designed to keep your child’s head stationary in the event of a side impact collision, resulting in up to 4 times higher test scores than other premium infant car seat brands. What’s great about this UPPAbaby car seat is its ease of installation. You can install the car seat using its SMARTSecure System that features auto-retracting lower anchor LATCH attachments or use their built-in lockoff for seatbelt installations. There is a tightness indicator and dual-sided level indicators to confirm whether the base has been installed correctly. This UPPAbaby infant car seat has a no-rethread harness with 5-position adjustable headrest. There are 2 crotch straps/buckle positions. The MESA is currently the only flame-retardant-free infant car seat in the United States. If you want to purchase one of the best infant car seat with narrow base, you can consider the MESA car seat from UPPAbaby. This Primo Viaggio car seat is a luxury car seat made in Italy and fits babies 4 to 36 pounds and up to 32 inches tall. This premium car seat weighs 9.5 pounds and measures about 17 inches wide, making it one of the best light and narrow infant car seat. The Peg Perego car seat base comes with an integrated anti-rebound bar for advanced protection in the occurrence of a crash. Its shell is perforated for maximum air circulation and lined with energy absorbing EPS foam for improved protection. The Peg Perego car seat is easy to install, and can be installed without the base, with color coded belt paths to assist with belt routing if base is not in use. The side impact protection adjusts to six different positions with no re-threading required to protect your child’s head and shoulders. You can attach this car seat directly to any Peg Perego stroller without having to use any adapters, except for the Pliko Mini and Skate. The Cybex Aton 2 is a lightweight carrier that weighs less than 9 pounds and measures about 17 inches wide. It is one of the most narrow infant car seat. It is a great option for small cars with less legroom as it does not protrude into the front seat as much as other infant car seats. If you are a tall driver or would like more legroom in the front, you may want to try out this car seat. Part of the reason why the Aton is one of the lightest car seat on the market is its careful design, such as putting the seat release mechanism in the car seat base. 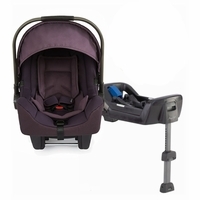 The Aton 2 Base has a unique belt tensioning system, which makes the car seat easy to install using LATCH or the vehicle belts. The Aton 2 infant car sat offers superior side impact protection with its energy absorbing shell and singular L.S.P. system, which transfers initial side impact forces to the seat’s shell. The shell absorbs the forces away from your baby, thereby increasing safety by 40%. There is also a height-adjustable load leg, a standard in Europe, that absorbs and distributes energy to your car’s floor. This reduces forces to the child in the occurrence of a crash. It also keeps your child perfectly positioned and prevents the seat from rotating forward. You can attach the Cybex Aton to any of the Cybex strollers, as well as other popular strollers, to create your own baby travel system. It is FAA approved for air travel, making it one of the best narrow infant car seat for travel. The Combi fits infants rear-facing from birth to 35 pounds and until 33 inches tall. It is one of the best slim car seat, measuring 17 inches wide. It is a lightweight and travel-friendly car seat. The Combi Shuttle car seat features an anti-rebound bar, an adjustable head restraint with deep side walls, and a layer of EPS foam that distributes forces away from your baby’s head, neck, and spine in the event of a crash. You can create your own travel system as the Shuttle is compatible with several Combi strollers. The Combi infant car seat is one of the best narrow child car seat. For more, read Combi car seat review. The Nuna Pipa is 17.4 inches wide and weighs only 7.9 pounds. It is one of the best narrow car seats for infants. It fits infants from 4-32 pounds and up to 32 inches tall. What’s great about this car seat is that it is one of the easiest infant car seat to install, taking only about 5 seconds! It is also one of the best infant car seats for taxi, as it can be installed using only the car’s seat belt and without the base. Its heavy duty shell is made from super resilient, high end plastics. This Nuna infant car seat has a 5-point harness and comes with an infant insert to keep your baby safe and comfortable. This stylish infant car seat features premium fabrics that keep your baby cool during summer and warm during winter. There is also an integrated drape that you can use to protect your baby. The canopy has a mesh window, which provides air flow for your baby while allowing you to check on your baby. The Pipa car seat works with Nuna and Maxi-Cosi adapters, allowing you to create a baby travel system with over 20 strollers. It is aircraft certified, making it one of the best car seats for travel. Below are the best narrow convertible car seats. The Clek Foonf is one of the best narrow convertible car seats, measuring about 17 inches at its widest point. 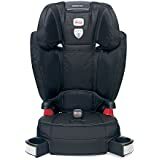 This high end car seat, as indicated by its expensive price, fits children in the rear-facing position from 14-50 pounds and in the forward-facing position from 20 to 65 pounds. It has a height limit of 49 inches, making it one of the best convertible car seats for tall babies. The Foonf car seat has a steel anti-rebound and advanced side impact protection for improved safety. Its aluminum honeycomb technology absorbs the energy from a crash, reducing forces transmitted to the child. Its REACT safety system also provides the same rear-facing safety in a forward-facing seat. The Clek convertible car seat has an adjustable headrest with deep side wings and energy absorbing foam layers. Its premium GREENGUARD Select Certified Crypton Super Fabrics provide protection against stains, moisture and bacteria. If you have triplets or need to fit 3-across convertible car seats, this gorgeous car seat may be just want you are looking for. It is one of the best narrow forward facing car seat. The newest Clek is the Clek Fllo, which has the same weight and height limits as the Foonf, but it is more than 10 pounds lighter. Like the Foonf, the Fllo also comes with an anti-rebound bar and is 17 inches wide, making it perfect for small cars. The Combi Coccoro car seat is one of the most narrow convertible car seats, measuring about 15.5 inches wide. This compact car seat allows you to fit 3 car seats in a row in many vehicles. It fits children rear facing from 3-33 pounds and forward facing from 20-40 pounds. The Combi car seat has a 5-point harness with a color indicator that ensures the harness is securely buckled. There are 4 harness heights, front harness adjuster, built-in lock offs and premium push-button LATCH connectors. There are also removable and washable cover, harness pads, and infant insert pillow. There is superior side impact protection and a tether connector strap that allows for rear-face tethering, stabilizing the car seat during a crash. The Coccoro is one of the best convertible car seats for taxis. You can install it with your child in the seat. One of the best things about it is that it is one of the only convertible car seats that can fit onto strollers, such as the Baby Trend Snap N Go EX carrier. This is a big advantage if you are traveling because once you get out of your taxi, you can put your car seat on a stroller instead of having to walk around carrying it. 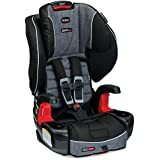 Diono Radian RXT is one of the best narrow all-in-one car seat, measuring about 17 inches wide. What’s great about all in one car seats is that they can be converted from a rear-facing infant seat to a forward-facing seat, and then to a booster car seat. The Radian RXT car seat fits infants in extended rear-facing position from 5-45 lbs, forward-facing from 20-65 lbs in a 5-point harness, and booster up to 120 lbs. It is one of the few car seats that allows your child to sit rear-facing until 45 lbs. This Diono convertible car seat is one of the safest car seats on the market with its full steel frame and aluminum reinforced sides. There is energy absorbing EPS foam, Safe Stop harness system, and infant body support cushion for enhanced safety and comfort. This all-in-one convertible car seat is lightweight and folds flat, making it great for travel. Its compact design allows you to fit 3 car seats across in most vehicles and is one of the best convertible car seats for compact cars. There are narrow high back booster seats and narrow backless booster seats. As one of the best narrowest booster seats on the market, they allow you tofit 3 across in the back of your vehicle. The RodiFix booster seat fits children from 40-120 pounds. It features Air Protect for superior side impact protection around your kid’s head. It does not have any arm rests, which make it easier to get your child buckled in, and it fits well next to wider seats. Its belt routing system is easy enough that children can buckle themselves in. RodiFix has LATCH connectors that hold the seat in place when the seat is not in use. This prevents the seat from turning into a projectile in the event of a crash. The seat features front-access recline system, which allows seat and seatback to recline for comfort and better fit to vehicle. This belt-positioning booster also has a multi-height headrest and expanding side wings that grow with your child. The stylish, premium fabrics are plush, comfortable, and self-wicking to help deodorize and draw liquids away from the skin. Compared to many other boosters, the RodiFix is more expensive but its premium features may be worth the price! The Parkway SGL is 18-inch-wide and fits children from 40 to 120 pounds and is Britax’s safest belt-positioning booster seat with SafeCell Impact Protection and an extra layer of side impact protection. This narrow car seat features ISOFLEX Latch connection system which secures the booster to your vehicle when it’s not in use so it doesn’t go flying during a collision. This Britax booster has a deep energy-absorbing shell and foam-lined headrest that make up 2 layers of protection to protect your child from side impacts. Another smart feature is its SecureGuard Belt-Positioning Clip that keeps children from sliding under the lap portion of the seatbelt in the event of a crash. The Bubblebum booster seat is one of the slimmest car seat on the market. 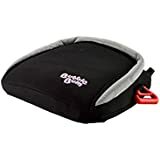 This inflatable booster seat is only 13 inches wide so you can easily fit three car seats across the back seat. It fits children from 40 to 100 pounds. This blow-up booster transforms from a small pouch to a booster seat for kids in less than a minute! The Bubblebum car seat is foldable and portable, making it great for travel, car rentals, taxis, carpools, and caregivers. When it is deflated, it easily fits into a handbag or backpack. Bubblebum booster seat can fit in the center seat of your 3-across installation even when nothing else seems to fit. 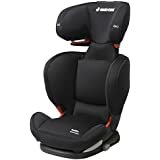 Check here for more best narrow booster car seats. 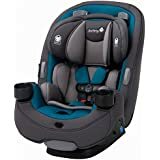 This entry was posted in Booster Car Seats, Car Seats, Convertible Car Seats, Infant Car Seats on September 20, 2018 by admin. Once your infant outgrows his first car seat, it’s time to look for the best toddler car seat 2019. If you are transitioning from a rear-facing infant car seat, you can consider looking into best convertible car seats, combination car seats, or an all-in-one car seat. We have compiled a list of the best toddler car seat. 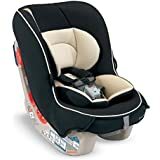 The Graco 4ever 4-in-1 convertible car seat is one of the best all in one car seat, which means that it can be converted into several forms, such as rear-facing infant seat, forward-facing seat, and as a booster car seat. It fits babies from 4 pounds all the way until 120 pounds, giving your child about 10 years of use! 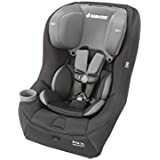 It can be installed rear-facing to fit babies from 4 to 40 pounds, forward-facing from 20 to 65 pounds, booster seats in high back belt-positioning from 30 to 100 pounds and backless belt-positioning mode from 40 to 120 pounds. This Graco all-in-1 car seat features a steel frame, energy absorbing padding, and a great harness system. The Simply Safe Adjust Harness System also adjusts the height of the harness and headrest in one motion. The 10-position headrest ensures that your child is comfortable and properly secured. It has a premium LATCH system for an easy, 1-second LATCH attachment. The booster provides padding that your child needs as well as giving him/her the necessary height. It includes plush inserts for newborns and has two cup holders, one on each side, which is convenient if you want to put a drink or snack nearby. Everything is machine washable. This Graco convertible car seat meets all applicable US safety standards and has been side impact tested. The Chicco NextFit is one of the top convertible car seats. This seat can be used rear-facing for children 5-40 lbs and forward-facing from 22-65 lbs. It can easily adjust to fit your child as he grows from infant to toddler. Chicco NextFit features Super Cinch LATCH Tightener, which uses force-multiplying technology for a tight and secure fit with little effort. There are built in lock-offs for vehicle belt installation. Its Recline Sure 9-position leveling system provides one of the most recline options a convertible seat can have. There are also height positions, so that your child can sit comfortably. When you adjust the headrest to a new height position, the 5-point harness automatically adjusts to accommodate your child’s shoulders. The car seat has Two Ride Right bubble levels that show correct seat angle in both rear-facing and forward-facing positions. This Chicco convertible car is one of the easiest convertible car seats to install correctly and safely in a wide range of cars. It comes with a removable infant insert, which has extra padding and gives newborns added support in rear-facing mode, starting from 5 lbs. The Diono Radian RXT all-in-one car seat is one of the best narrow booster seats on the market. 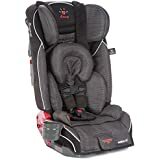 It fits your infants in extended rear-facing position from 5-45 lbs, forward-facing from 20-65 lbs in a 5-point harness, and booster up to 120 lbs. What’s great about this car seat is that it is amongst the few that allows your child to sit rear-facing until 45 lbs. Every pound is precious and the longer you let your child sit rear-facing, the safer your child is. For more information, you can read more about child car seat safety. The Diono Rainier, a similar convertible car seat, allows your child to sit in the rear-facing position up to 50 lbs! 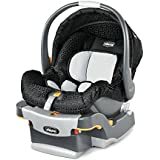 This Diono convertible car seat has a steel alloy frame and aluminum reinforced sides, making them one of the safest convertible car seat on the market. It features energy absorbing EPS foam, Safe Stop energy absorbing harness system, and adjustable reinforced head support. The adjustable head support has 12 height settings to ensure a right fit as your child grows.The car seat comes with infant support cushions for additional safety and comfort. This all-in-one convertible car seat folds flat, making it one of the best car seats for travel. Its folding design makes storing and traveling with the seat easy. You just need to purchase the carry straps separately if you want to carry it on your back. Its narrow car seat design makes it one of the best toddler car seat for small cars. The Evenflo Tribute LX Convertible Car Seat is a great, cheap toddler car seat. It fits rear-facing infants from 5-30 lbs and up to 37 inches tall. It fits forward-facing toddlers from 22-40 lbs and 28-40 inches tall. Designed, engineered, tested, and assembled in the United States, the Evenflo Tribute LX is a lightweight and compact car seat. Its small size makes it perfect for transferring between multiple cars, or just carrying around during travel. In fact, it is one of the best toddler car seat for traveling. The car seat is easy to install with its LATCH system. There are 4 shoulder strap positions on this car seat to accommodate growing children longer. There is also an easy to access upfront harness adjustment and buckle release, making it convenient for you to make simple harness adjustments. This also helps to get your child in and out faster. The car seat pad can be easily removed and is machine washable. It is side impact tested and uses energy levels almost 2 times the Federal Crash Test Standard for multiple-shoulder harness positions. Energy absorbing foam liner is used to provide safety and comfort. The Britax Clicktight booster car seat is a 2-in-1 booster seat and is one of the best toddler booster car seat. It fits children in the harnessed forward-facing position from 25-90 pounds and in the belt-positioning booster position from 40-120 pounds. Made in the USA with global components, the Frontier is a top-selling booster seat with ClickTight Installation System for easy and safe installation every time. You just need to open the front of the car seat, buckle the seat belt across and click the seat shut. The seat won’t budget and that’s all you need to do for installation! It features SafeCell Impact Protection, which is an integrated system of safety components available only with Britax car seats. These components include a steel frame, energy-absorbing base, and impact-absorbing tether with staged-release stitches that reduce forward movement in the event of a collision. Its deep energy-absorbing shell and foam-lined headrest that keeps your child’s neck and head secure are 2 layers of protection to shield your child from side impacts. As one of the safest car seats, the Britax Frontier car seat is perfect for growing toddlers. The harness adjusts to 9 different positions for a more customized fit. The Clek Foonf is a luxury car seat, as indicated by its expensive price, and is one of the best convertible car seats for toddlers. This gorgeous seat fits children in the rear-facing position from 14-50 pounds and in the forward-facing position from 20 to 65 pounds. The Foonf car seat features a steel anti-rebound and advanced side impact protection, making this one of the safest toddler seats you can buy. Its aluminum honeycomb technology absorbs the energy during a crash, reducing forces transmitted to the child. Its REACT (Rigid-LATCH Energy Absorbing Crumple Technology) safety system also provides the same rear-facing safety in a forward-facing seat. The Clek Foonf has an adjustable headrest with deep side wings and dual layers of energy absorbing foam. Its premium GREENGUARD Select Certified Crypton Super Fabrics provide protection against stains, moisture and bacteria. If you are using this car seat for a newborn, you add the infant-thingy accessory. This car seat measures about 17 inches wide and is one of the best narrow convertible car seats, so you can fit 3 across in many vehicles. There is a newer car seat model called the Clek Fllo, which has the same weight and height limits as the Foonf, but it is more than 10 pounds lighter. The Fllo also comes with an anti-rebound bar and is 17 inches wide, making it one of the best car seats for small cars. This Maxi-Cosi Convertible Car Seat is one of the top 10 toddler car seats. It fits children in the rear-facing position from 9-40 pounds and forward-facing from 22-70 pounds. 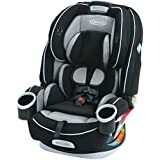 This 2-in-1 convertible car seat features three different recline positions for a more customized fit to your car and is easy to install with its LATCH connectors. 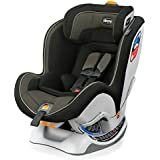 This Maxi-Cosi car seat is known for its advanced safety with FlexTech and Air Protect Superior Side Impact Protection, which provides extra safety around your baby’s head. It features premium self-wicking fabrics that deodorizes and keeps liquids away from the skin to keep your baby dry. The seat pad and harness covers are removable and machine washable. You do not have to rethread the harness when taking off the pad. The Safety 1st Grow and Go 3-in-1 convertible car seat fits children in the rear-facing position from 5-40 pounds, forward-facing from 22-65 pounds, and belt-positioning booster from 40-100 pounds. This convertible safety seat is narrow so it takes up less room in its rear-facing position, giving up to 7 inches more leg room for parents in the front seat. Not only is this seat comfortable for babies, but for parents as well. 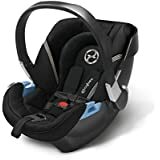 This 3-in-1 car seat has a 3-position recline and features Quick Fit Harness, which lets you adjust the height of both the harness and headrest in one easy step. In both rear-facing and forward-facing positions, there are harness holders that keep the harness in an open position so you can easily get your baby in and out of the seat. This Safety 1st convertible car seat comes with 2 comfortable and removable pillows. It is one of the best toddler car seat for sleeping. The Cosco Finale booster car seat is one of the best toddler car seat booster. It fits children from 30-65 pounds in the 5-point harnessed forward-facing position and from 40-100 pounds in the belt-positioning booster position. The Finale DX booster car seat is a slim booster seat and it is one of the best booster for 3 across. This booster seat is also lightweight, which makes it easy for you to move it between cars. The car seat pad is removable and is easy-to-clean. It is machine washable and dryer safe. There is a cup holder that detaches for use on either side of seat. 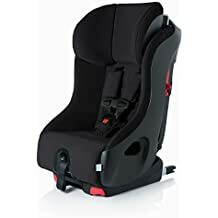 It is very affordable and is one of the best toddler car seats under $100. This Combi convertible car seat fits children in the rear-facing position from 3-33 pounds and forward-facing from 20-40 pounds. There is a tether connector strap that allows for rear-face tethering. It is one of the best slim car seat that allows you to fit 3 seats across the rear seat of most vehicles. 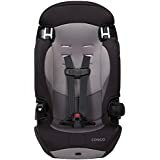 The Combi Coccoro car seat features a 5-point harness with a color indicator to ensure the harness is buckled securely, 4 harness heights, front harness adjuster, built-in lock offs and premium push-button LATCH connectors. The Combi Tru-Safe Side Impact Protection features deep side walls and a layer of energy absorbing foam to distribute energy away from your child in the event of a collision. You can easily remove the car seat cover and harness pads to wash. It comes with a removable infant insert, perfect for newborns and smaller children. It is also one of the best convertible car seats for taxis. You can easily install it with your child in the seat and it fits onto strollers, such as the Baby Trend Snap N Go EX carrier. It is one of the only convertible car seats that fit onto a stroller. This is a big advantage when you are traveling, because after a taxi ride, you would probably want to put your car seat on a stroller rather than walking around carrying it. Some parents actually purchase a convertible car seat from the start and just use an infant insert. One of the best reasons to use this type of car seat is that it allows your baby to remain in the rear-facing position for longer. The American Academy recommends to leave babies under the age of two in the rear-facing position if permitted by the car seat’s height and weight limit. Once your baby reaches the rear-facing height and weight limits, it is time to sit in a forward-facing position. Convertible car seats can be switched from the rear-facing position to forward-facing. 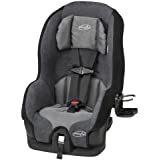 This entry was posted in Booster Car Seats, Car Seats, Convertible Car Seats on September 15, 2018 by admin.